This Dining Room is a combination of rich & luxurious textures, giving it a contemporary but warm feel. The metallic flocked wallpaper from Larsen has a strong linear design that works in contrast to the circular mirror, from Christopher Guy, and the Italian leather dining table. A Porta Romana standard lamp stands in the corner and lights the full silk curtains; fabric from Manuel Canovas. 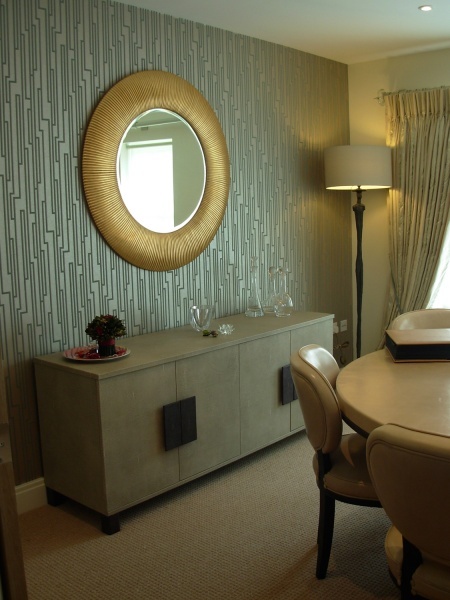 The sideboard was a specially commissioned piece from Chelsea Harbour based company, Simpsons Mirrors, finished in faux shagreen.